Planning a visit to Italy and its wineries in the next few months? Nice idea! And you’re lucky, because in our technological times you do not have to weigh yourself down with paper guides, books, maps, leaflets or brochures. Everything you need for your journey is in a convenient app for smartphone or tablet. As an Italian with an iPhone and an iPad, I tried out several of these apps on my own devices and found a couple that are very good. In the digital market there are many apps tagged with keywords like “wine” or “Italy” but very few of them combine the two. 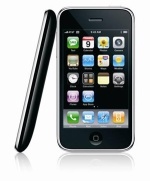 Some of the apps are very general; they are good guides for the generic tourist. Others are quite specific, usually created for one particular winery, hotel, or region. Those are fine if you decide to visit one place, but they are not very helpful if you would rather tour around, and do not have a defined destination—or if you have more than one destination in mind. 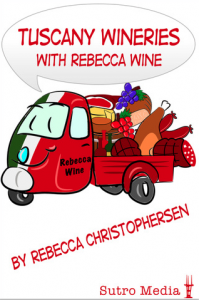 Tuscany Wineries with Rebecca Wine ($4.99). No doubt, Tuscany is a favorite destination for wine lovers around the world. If you go to this region and rent a car, this app offers you a selection of the best wineries to visit, with their mapped locations and helpful info like opening hours, winery tours, any fees for tours or tasting, etc. Moreover, it also suggests restaurants, places of interest and towns worth visiting. 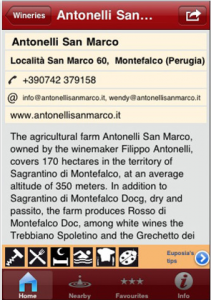 The app also provides plenty of additional information about native grapes, and some general info about other Italian wine regions. 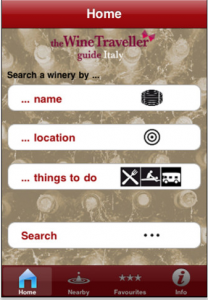 The Wine Traveller/Italy ($4.99) This is the most complete app I found. In order to learn more about it, I wanted to interview one of its creators. 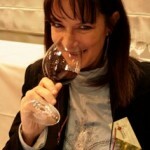 I contacted Massimiliano Rella, the editor of an online journal with the same name as the app, www.thewinetraveller.it . “The app is not merely an electronic version of the magazine, but its natural continuation,” he explained to me. “With some colleagues and friends like Elena Benedetti (publisher of Editions Advertising Italy) and Beppe Giuliano (editor of Euposia magazine) we decided to do something new: an app in Italian and English dedicated to the wine tourist. Not concentrating on wines and on their characteristics (those apps already exist!) but on what a tourist—even a general, non-wine-loving tourist—can see and do in a winery. 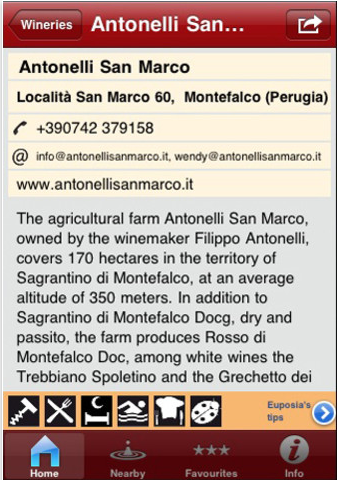 The app is geo-referenced, easy to use both online and offline, and provides users with information about 1200 Italian wine estates in all regions that, in addition to good wines, offer a lot to enjoy during your free time. This guide is a unique take on what anyone—even non wine-lovers!—can do and see at the best Italian wineries. Overnight stays? Easy, here are 369 addresses of wineries that offer rooms amongst the vines. Searching for a swimming pool? Here are 142 wineries to dive into, close to the vineyards. Are you in the mood for a cooking lesson? No problem, 48 wineries organize courses of regional and Italian gastronomy. And much more: wineries with spas, camper parking, beauty treatments with wine therapy, wine museums, art and architectural wonders in the wine cellars, and even beautiful locations for weddings and special events. Last but not least, wineries with organic vines. A true snapshot of Italy in the hands of wine tourists. Hi nice article, many thanks. 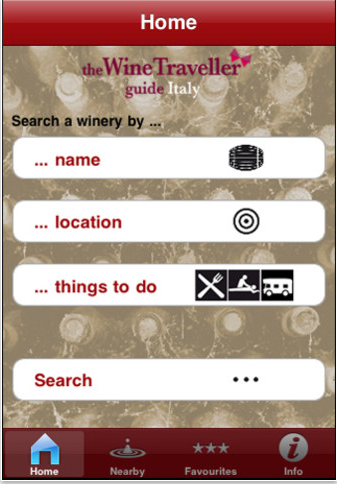 We just want to inform you that within march wineries of The Wine Traveller Guide/Italy will become 1.400 and that also a new Android version will be launched for other smartphone and tablets. I really like to try the two apps for iPad and iPhone to make the most of your time having a wine tour in Italy. I think that I would be able to make use of this great application and enjoy my vacation at Italy. I know that many people would also love this great application. I am going to get the Wine Traveler Italy app just because you mentioned ” Last but not least, wineries with organic vines.”. Although, love the fact that it also has so many other things to offer besides wine tastings, this is a really important piece to the puzzel. I am glad you took note of this, because wine travelers always need to mix up the wine tasting with other fun and cultural events. A great California Organic Wine app that sounds similar is VinOrganica. Nice little write-up on the app, I often receive requests from folks interested in visiting Italian producers, and this app looks like it would be a big help for them. I like the fact that the database can be expanded regularly to add more Italian wine producers, and even add some of the lesser known wineries that make great wines but are off the beaten path. Great information, thanks for sharing! Isn’t it amazing that the technology of an iPad showing where to find the old world tradition of wine making. Certainly a must have App for the wine lover in us all!